Interview with Robert Stallworth and Joel Scherzer conducted January-March 2012. Last year I received a cryptic e-mail from a record collector who told me about a doo-wop single recorded in Colorado, or one that had ties with someone in Colorado. The single, "Alone and Blue," by The Five Bucks, blew me away. In all of my years of collecting, I had never heard the single. But what caught me as odd was while the sound was something straight out of the 1950s, the actual single appeared to be, at least, issued in the 1970s. I tried every possible avenue to locate information on the group. Who were these guys? Why was there absolutely no information on this record? So, after almost a year of searching, I contacted my dear friend, and fellow Colorado record collector, Joel Scherzer. "Yeah, I know about the Five Bucks," he told me. "I put out that record." 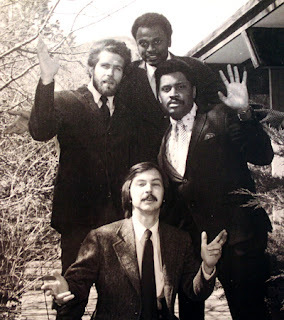 In the mid 1970s, Joel and fellow music lover, Robert Stallworth, who was attending medical school in Boulder, teamed up with Casey Hynes, a professor at CU-Boulder, and fellow student Gerald Gantt, to occasionally sing doo-wop tunes--a genre they all loved. 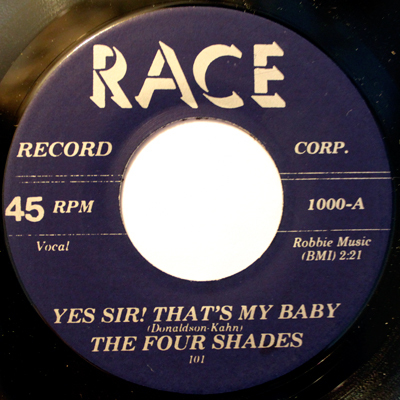 They soon decided to form their own group, the Four Shades, and start up their own label, Race Records. The first release from the group was "Yes Sir! That's My Baby," and the b-side, "Stormy Weather" (Race 1000). Looking for additional material to release on their new label, Scherzer looked to Stallworth's extensive record collection--and several acetates of unused material from R&B groups, whose real names are lost to posterity. "While looking for old records in Gary, Indiana in the 1970s, I came upon three acetates, possibly recorded in the 1950s, of unknown and unnamed singing groups," said Stallworth. "The songs were "I Got Goofed," "Just Rhymes," and "My Mama Done Told Me." When we were putting together our label, we decided to release these, and give the group the name of The Five Bucks." "I Got Goofed" and the flip "Just Rhymes" was the second release for the label (Race 1001). Needing a fourth song to put out a third single, the duo used a 1971 recording Stallworth had made while a student at Millikin University. "We never performed anywhere, we just sang together for fun. I had a radio program, and a crude way of recording at the station. So one night I asked the guys to come up and sing a song. We decided to do our version of the Delacardos, "Got No One." Along with Stallworth, the members of the group were lead singer Gregory Purvis, Nelson Harvey, Ronald Thompson, and Charles Fields. "After the recording, I decided to add a sixth voice," Stallworth said. "I added a falsetto tenor top to the background." 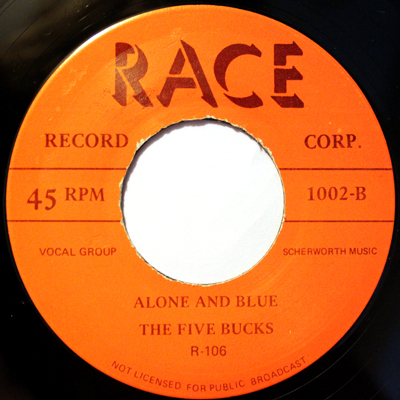 The song was renamed "Alone and Blue," and was the b-side to "My Mama Done Told Me" (Race 1002). 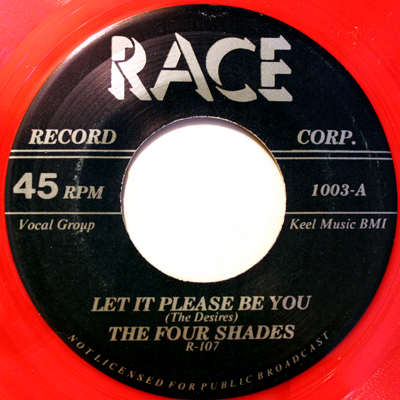 The Four Shades would record just one more single, "Let It Please Be You"/"I Thought You'd Care" (Race 1003--red vinyl). The group eventually broke-up, after Gantt headed off to graduate school, and the other members pursued other interests. In 1987, Stallworth and Scherzer teamed up again to release "Sittin' on the Porch"/"Hair-Net" (Jay-R 100). The record was credited as the 5 Peaks. "I only minimally knew Maurice Simpkins at the time of the Race releases. I was in Colorado and Maurice was in Chicago," Stallworth said. "I did not really reconnect with Maurice until after I moved back to Illinois, which was in 1982. Maurice and I were friends again by 1983. One day while I was at this apartment, I noticed an acetate on the floor behind his living room couch. It was "Sittin' On The Porch" as done by Maurice and his group, The Five Chimes. "I asked Maurice if he could get some of his singing friends to record two songs and I would have them pressed up. I asked Maurice if he could re-do "Sittin On The Porch" and he agreed, since it was a song which he already knew." 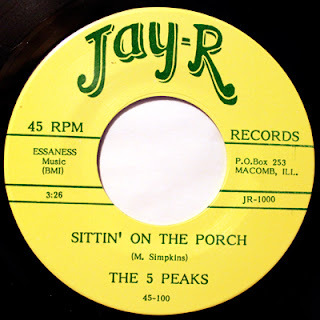 "Sittin' on the Porch" was a departure for us in that the recording included instrumental accompaniment. Robert sang lead and overdubbed the bass part. I didn't sing on this one, but I came up with the name and design of the label, the name of the group, and also helped with the distribution," said Scherzer. "It got airplay on various radio stations around the country, most notably WCBS-FM in New York." 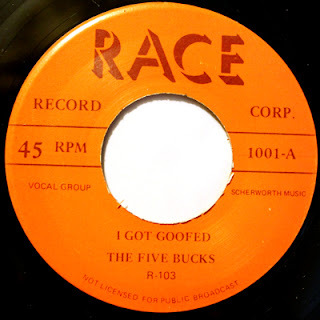 The song was released on the Jay-R label (JR 1000), and was later included in the Heavy on Doo-Wop CD series. Joel Scherzer lives in Pueblo and runs a successful online used record operation. Robert Stallworth is now retired in Nevada, after a career in medicine. Casey Hynes divides his time between Colorado and Paris, France. Gerald Gantt's whereabouts are unknown.